chilli, the ultimate comfort food? Comfort food is a deeply personal often emotional subject, and I think comfort foods change at different stages of our lives. If you’d asked me as a child what my comfort food was it would have been ice cream, jelly or maybe chocolate blancmange ; definitely not chilli ! When I was younger I refused to eat anything spicy, my Mum likes to remind me that she would dutifully set aside a portion of non chillied chilli for me, before adding spice for the grown ups. It wasn’t until I made curry at school that I realised I quite liked spicy food. I haven’t looked back since. I pride myself on making good chilli both meat based and vegetarian and am always looking new recipes to try. My latest trial is a keeper. A lamb chilli from U.S.A by Sheila Lukins a weighty 604 page encyclopedia of down home american cooking, it was a bargain on Amazon and I can see it becoming a firm favourite. 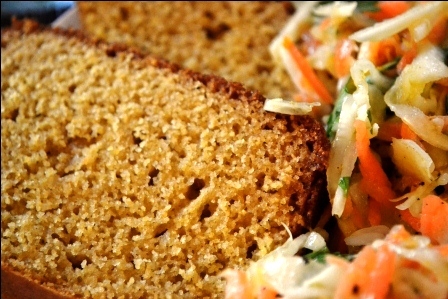 The corn bread and zesty picnic slaw are also from the same book and routed the meal firmly in the southern states (and thus not for slimmers). The chilli was everything I want in a chilli, spicy and hot but not eye watering, savoury but with a hint of sweetness thanks to the addition of molasses. 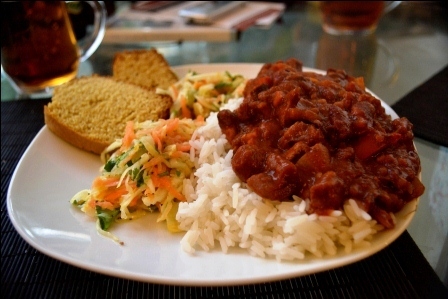 Ancho chilli and a bottle of beer give it a deep, rich earthy flavour which develops over the long slow cooking period. It isn’t speedy comfort food! I also think it would work as a meat free recipe with lentils or a mixture of beans rather than lamb. The cornbread is recommended with it in the book and makes it feel very American, I love its sweet taste and slightly sandy texture alongside the chilli, but can see that others might find it odd at first. It was my idea to have the slaw with it, partly because I thought we should have some fresh veg to balance the meat and carbs! As it doesn’t use mayo like many coleslaw recipes it was very light and fruity with a dressing based on orange juice, a nice balance to the richness of everything else, a is a bit of healthiness on the side. This was a truly epic chilli, if I had a freezer I would make a vat of it so I could have some on hand for emergencies and emotional crises, I know things would feel much better with a plateful of this in front of me. What’s your go to meal in times of need? A New Year treat but one that didn’t require much effort, we went to a friends for New Year and I thought we wouldn’t feel like cooking much; but a treat on New Years Day is a tradition in my family so I thought I would try curing a piece of salmon. We had a great time at the party but my I was spot on about not wanting to cook anything! 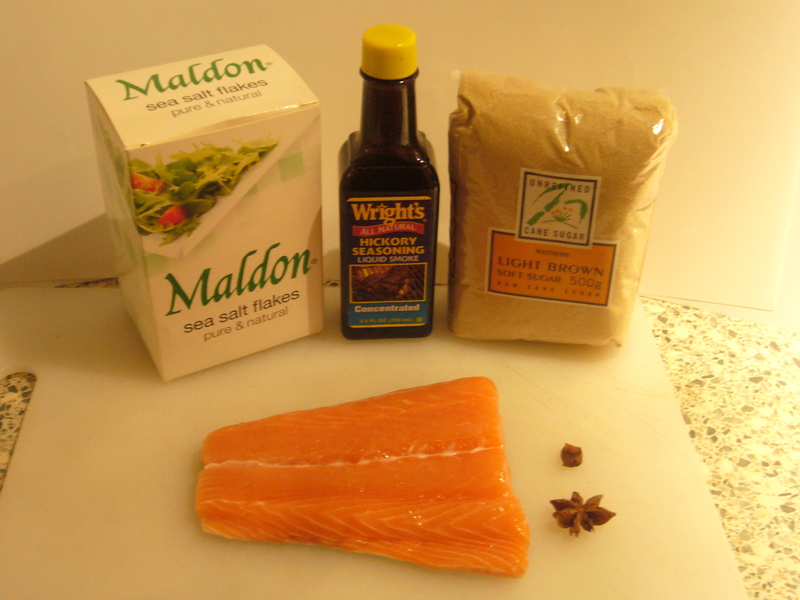 The method is more assembly than anything, rub the liquid smoke over the salmon flesh. Blitz the star anise, salt and sugar. Place a third of the mixture on a piece of cling film roughly in the shape of the fish and place the salmon skin side down and cover with the rest of the mixture. Wrap tightly in cling film and leave in the fridge for 24 hrs. To serve, wash the cure off the salmon thoroughly, otherwise it tastes waaaay to salty, thinly slice and serve. Would be nice on blinis with cream cheese or sour cream, or scrambled eggs. 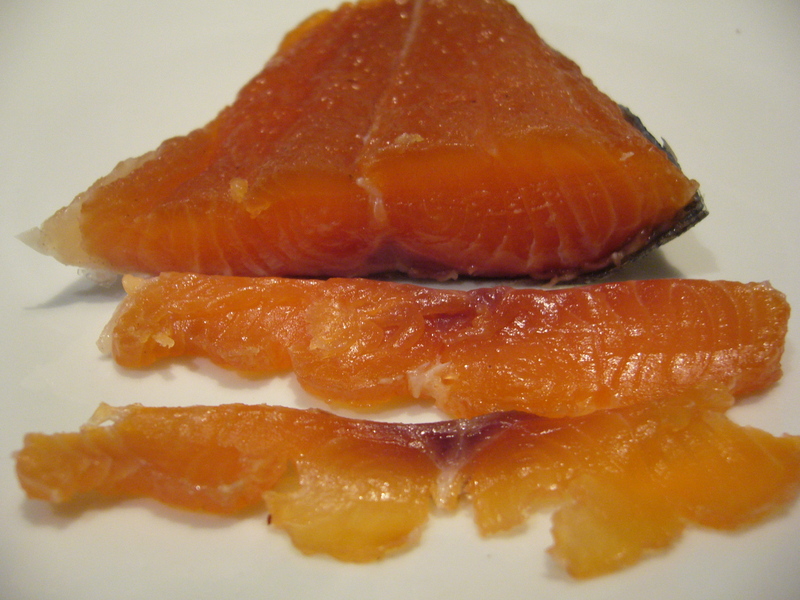 I’d definitely try this again, but maybe up the liquid smoke and tone down the star anise and sugar to try to make something smoked salmonish; as it was the cure was very stong and the salmon needed a good rinse, but if I’d used a bigger piece of fish it would have been less concentrated.